On a couple of occasions, I've bought the pre-rinsed quinoa just so I wouldn't have to do it myself. But the pre-rinsed is more expensive than the 'regular' type, so the 'regular' type is normally what I buy. And sometimes I've rinsed it, sometimes not. Do you notice a difference in taste and texture of your quinoa if you rinse it before cooking? Or do you feel it's pretty much the same? I haven't noticed a huge difference at all, except one time the quinoa tasted a little sandy and gritty, but that could have just been the specific brand. LOL, I don’t EAT quinoa, so no, I don’t rinse it! Um, okay. Thanks for your helpful contribution. The first quinoa I got was the white, and it would foam up big time when I washed it. However, when I started buying the red and black, it never foamed up, and I later read that it was usually prewashed. And, while red and black are normally more expensive, I got them in large amounts on ebay or Amazon, for less per pound than I could find white for. 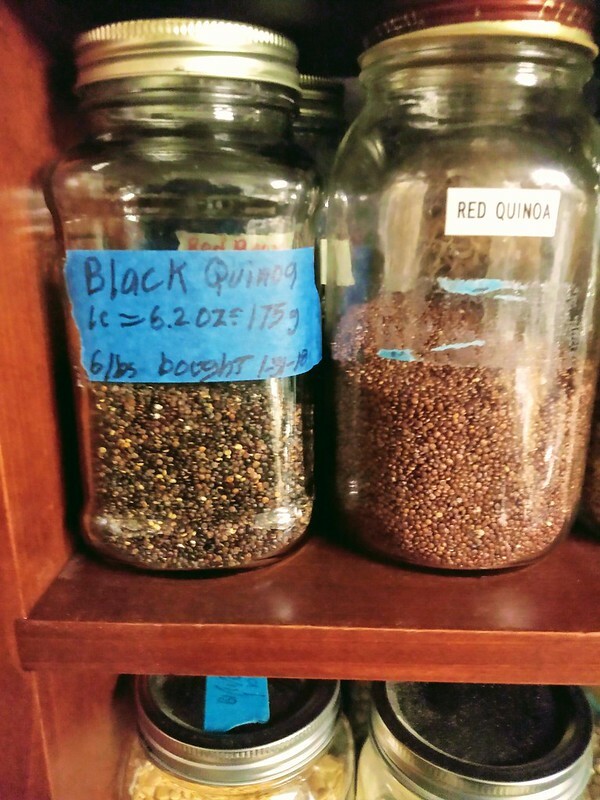 I've never even seen red or black quinoa. Does it have the same taste as the white or is it somewhat different? Linda, The red and black have slightly different flavors, and a little stronger than the white, but still, the flavors are pretty much all covered up by other flavors in almost all dishes they are used in. I have tried dry toasting quinoa in a pan, before cooking in liquid - something that gives some grains a better flavor - but this didn't help with the quinoa. I first learned about these different quinoas on Chef Brad's Fusion Grain Cooking. I usually have a box of pre-rinsed quinoa in the pantry and like to make a cup or so a week, and add a spoonful or two in my morning scrambled eggs. I've also used quinoa in a summer salad....like pasta, it soaks up whatever dominant flavor it's used with, so I don't think the colors taste much different, although the combo is very pretty. I'm out now, and can't remember the name of the boxed brand I buy...I think it's 'Ancient Harvest', or something like that. I'm not really fond of quinoa on it's own, but I like it as a filler and feel like I'm getting a little extra protein. Here's a pic of a summer salad from a few years ago. Pretty tasty - but again, it just soaks up whatever dressing is added to it. I also put quinoa in a lot of salads, esp. in the summer, when I make a lot of raw tomato pasta salads, and I like to add some legumes and grains to them, in place of some of the pasta. I also add it to curries, and similar things, when I have some it pre-cooked in the fridge. Especially in the summer, I cook some up, and keep it in the fridge, for many of these things. I learned a trick for cooking it from the booklet I got with the IP - put in 1 c rinsed quinoa and 2 c water, plus salt, if desired, put the lid on, and set the manual timer to 1 minute - that's right, 1 minute! of course, it takes a while to get the pressure up, but it cooks just one minute, then you let the pressure release naturally for just 5 minute, then release the rest, which is very little, since almost all of the water was absorbed. I always add another 1/4 c water to the red and black, because they seem to absorb more than the white. What a great idea! I do something similar; I buy flax meal and add it to my hot cereals and some other foods as well. I don't even know it's in there. Very interesting, never heard of it cooked that way before. And I love how organized your pantry is. I love making quinoa patties. Here's a link to my favorite recipe. These are so delicious. Sadly, I have not acquired a liking for quinoa.. I've tried it in restaurants and have made my own 3 times.. I finally gave up on it as one of those things I just don't care for..